As happy as I’ve been to watch Scheifele wildly exceed practically everyone’s expectations, I always cringe a little when I hear people talk about putting an 18 year old in the NHL. There are just too many examples of talented teens ascending too quickly to apparent NHL glory and falling flat on their faces – from the well traveled story of Alexandre Daigle, to the lesser known one of Steve Eminger, and the more recent case of Gilbert Brule. All of them were incredibly talented junior players, and looked to have long, distinguished careers ahead of them. Unfortunately, that’s not how their stories were written. Instead, they were each pried from junior hockey before they turned 20. They each showed flashes of brilliance – enough to stick in the NHL at such a young age – but within a few years, each of them plateaued, or even regressed in their play to the point where they were traded from the team that drafted them. Daigle was drafted 1st overall – the can’t-miss prospect of 1993. The Senators were so enamoured with his talent that they signed him to a 5 year, $12.25M deal. It was the largest contract ever given to a rookie, and led to the introduction of the “entry-level” deal, which stipulates that rookies receive a 3 year contract with a maximum salary (now around $1M per season, not including bonuses). He entered the NHL at age 18, but after a few seasons of underwhelming play, he was traded at the age of 22. His career high in goals was 26, and he scored fewer than 20 goals in 7 of his 10 NHL seasons. Eminger was drafted a bit later – 12th overall in the 2002 draft. Though no prospect is ever guaranteed to become a good NHL player, with his great size and elite skating ability, Eminger looked close as they come. He stuck with the Washington Capitals at age 19, but after playing 17 games in the big leagues, he was sent back to junior hockey. The following year, he spent another 40 games in the NHL, with unimpressive results. He had a few marginally good years in his early 20’s, but at age 24, just when he should have been hitting his prime, he was traded. He’s bounced around ever since, playing with 6 different teams in the last 4 years. He’s found a home for now as a 3rd pairing defenceman with the New York Rangers, but it’s a long fall for a player who was once considered a likely top-pairing defenceman. Brule was a tremendous prospect back in 2005. He played with the WHL’s Vancouver Giants, and was touted as the next-most talented player in his draft year after Sidney Crosby. Although he was small – just 5’10, 175, he played like a mini-version of Eric Lindros – physically dominating bigger opponents and scoring almost at will. Blue Jackets GM Doug MacLean was so excited that he put Brule in the NHL at 18. After a brief 7 game stint where he was pretty impressive, Brule broke his collar bone and was sent back to junior, where he imposed his will upon virtually every game, leading the Giants to the 2006 Memorial Cup and claiming WHL Playoff MVP honours. Then at 19 he again made the Blue Jackets roster out of camp, where he stuck the whole year. But although he was seemingly too dominant for junior hockey, he wasn’t able to make a dent in the NHL scoresheet, putting up only 19 points in 78 games. The following year, when his contributions should have been increasing, he fell out of favour with Head Coach Ken Hitchcock and registered only 9 points. He was sent down to the AHL, and eventually traded to Edmonton. He was out of the organization by 21 – the age at which most players have just completed their first year in the AHL. These are just three stories of players who failed to live up to expectations. Admittedly, there are a number of counterpoints – players who have had immensely successful careers after starting in the NHL at a young age. But in those arguments I always offer the following: show me a player whose development has been harmed by beginning his NHL career too late and I’ll show you a hundred who have been harmed by starting too early. Kevin Cheveldayoff said something to this effect a few days ago, and it was like music to my ears. Teams like Detroit and Nashville develop players better than most other teams because they never give away a roster spot to a young player. In fact, they actively block their path to the NHL. They say “I don’t care how talented you are – if you want to play in the NHL right now, you need to be better than an experienced NHL player”. Detroit Head Coach Mike Babcock simplified it like so the other day, saying basically that you either need to be scoring goals or stopping goals to be a useful NHL player. It’s extremely rare that young hockey players – particularly teenagers – will help an NHL team prevent goals. (Jordan Staal is about the only one in recent memory to do so as a teenager.) They are usually defensive liabilities because they’re smaller, weaker, learning new defensive systems, and struggling to adapt to the overwhelmingly fast pace of play. Furthermore, the difference between the goals you help produce and the goals you allow is the most basic measure of effectiveness. You need to create more offence than what’s going the other way when you’re on the ice, otherwise you’re hurting your team. It takes most forwards at least a few years before they hit their scoring prime (usually around age 24-25), and a few more after that before they start playing good defence (if they ever do). It’s asking a lot of an 18 year old to come into an NHL lineup and contribute when they’re physically mauled on the ice, facing an intense learning curve on and off the ice, all while adjusting to the general environment of the NHL which involves intense travel and various off-ice ‘distractions’. So here’s the alternative. Scheifele, and virtually all other teenage hockey players like him can go back to junior hockey and play with their friends and peers. They can play huge minutes in all situations – even-strength, pp, pk, etc. They can build up their speed and strength. They can represent their countries at the World Junior Championships where they play the best players in the world in their age group. They can lead their teams through long playoff runs and (if playing in the CHL) try to capture the Memorial Cup – which is one of the toughest trophies to win in all of sports. (It’s almost like winning the Stanley Cup and then playing a 4-team tournament on top of that to decide the winner). Then, when they complete their junior career and turn pro at age 20, they can spend part of a season in the AHL and prove, against solid professionals, that they’re too good for the second-best league in the world. It seems to have done no harm to players like Mike Richards, Jeff Carter, Danny Briere, Claude Giroux, Ryan Getzlaf, Corey Perry, and Bobby Ryan, all of whom spent time in the AHL. So did Duncan Keith, Shea Weber, Zdeno Chara, Keith Yandle, Eric Staal, Thomas Vanek…the list goes on. Henrik Zetterberg and Pavel Datsyuk and also don’t seem to have been harmed by playing too long in lesser European leagues – they started their sparkling NHL careers at ages 22 and 23 respectively. The great Nick Lidstrom started at age 21. Winnipeg’s best defenceman – and I’d argue best player too – Tobias Enstrom, also didn’t come to the NHL till he was good and ready at age 23. I think the point is made, but there are so many more examples one could give. For every Crosby, Stamkos, Doughty, etc, there are about 10 other really good players who took a slower development curve. 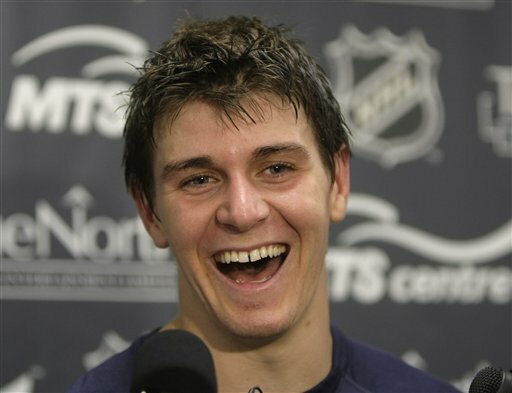 Scheifele looks very good, but he’s no Crosby. He will be a very good player one day, maybe even a first-line centre who can put up 70+ points, but there’s a much better chance of that happening if he takes the slow route to the NHL. This entry was posted in Winnipeg Jets and tagged Alexandre Daigle, Gilbert Brule, Jordan Staal, Kevin Cheveldayoff, Mark Scheifele Jets, Mark Scheifele junior, Mark Scheifele training camp, Mike Babcock, Tobias Enstrom, Winnipeg Jets, Winnipeg Jets send Scheifele to junior by Peter Siamandas. Bookmark the permalink. A few people have said that about the bird, so I’ll definitely consider it; a little market research may be in order. Interesting points, and I agree with many of them. The only concern that I have is injuries. Bill James stated once (and I know that the two circumstances aren’t exactly the same) that there is “no such thing as a pitching prospect”. If an athlete can contribute at the highest level, they should be doing that as soon as possible. His argument was that injuries so often derail athletes careers (see: Greg Oden) that it makes no sense to wait for a draft pick to maximize their potential. What if, two years down the road, Scheifele blows out his knee, or gets a concussion and never plays another game? Will it really have been better for him to develop for that time in junior hockey? This is obviously a hypothetical situation, but with the careers of too many players in jeopardy due to head injuries, I think it’s relevant. Whether or not its the right decision? I’m not sure, but it’s worth thinking about. I agree with almost everything you said except for one tweak: I think it’s actually more likely that a player – especially a young player – would be hurt in the NHL than in junior hockey. In the NHL he is physically undersized and overmatched, and when he’s a high pick, like Nugent-Hopkins this year or Hall last year, he has a bit of a target on his back. I don’t specifically know concussion rates in junior hockey, (I follow junior hockey somewhat closely through the year), but I haven’t seen many promising junior hockey prospects lose their careers to concussions. My suspicion is that concussions and other injuries are far more common in the NHL because the players are bigger, faster, and stronger, and the schedule is longer and more intense, with less rest between games.